An inspiring 1907 mosque hosts a multi-ethnic market in the oldest known city in sub-Saharan Africa. 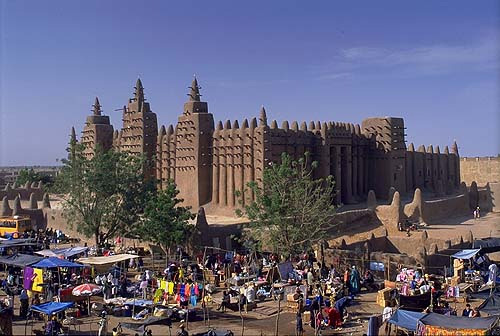 The most notable days at the Great Mosque of Djenne are market days, when the square in front of the Mosque fills with vendors and shoppers. People of the various ethnic groups of Mali come together at this weekly market to purchase everything from cattle, meat, fish, vegetables, rice, and all sorts of household goods. The sights and smells of the market mix together, and negotiations between dealers and customers can be overheard. 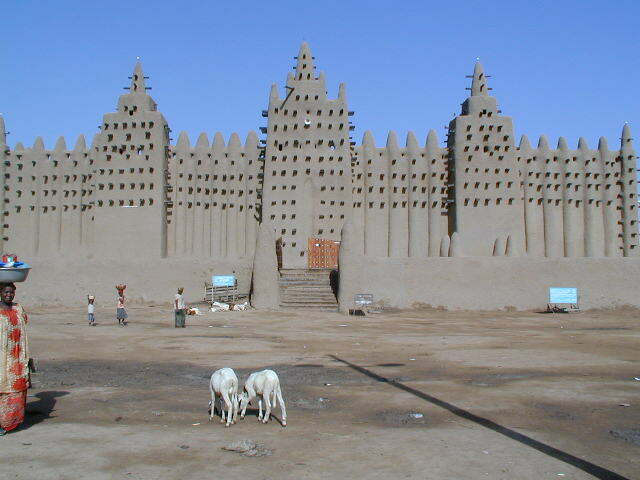 This Mosque is completely constructed from mud _ mud bricks, mud mortar, and mud plaster. This kind of mud structure can last for centuries if regularly maintained. Once a year, the entire community of Djenne comes together for a festival to make repairs to the Mosque. The festival includes music and food, but the main purpose of it is to repair any cracks or eroded areas of the structure. Huge pits of mud plaster are made in preparation, and the festival kicks off with a race to see who can be the first to bring the plaster to the Mosque. The site has been the location of a Mosque since 1240, but the current Mosque was completed around 1907.